EXETER, PA - Quantum Rehab® is pleased to announce its implementation of a customized cloud-base application that allows real-time market feedback, centered around consumer experience, to rapidly respond toward enhancing products and services. "Focusing on consumer-inspired complex rehab products and solutions, we wanted a way to convey consumer and market feedback throughout our entire organization as quickly as possible for prompt solutions and results," shares Megan Kutch, M.S. O.T.R., Director of Quantum Marketing. "With the cutting-edge technology of QRRS, we have the ability to distribute consumer needs from the field among our team almost instantaneously, and deliver solutions remarkably fast." QRRS was recently used to enhance Quantum's iLevel™ seat elevation technology. "Consumers loved iLevel at 3 mph, but felt it could use a little more speed for crossing streets while elevated for visibility," explains Jean Sayre, M.S. O.T., ATP, Senior Director of R&D Clinical Development. "QRRS allowed immediate consumer feedback from the field, and with all of the proper protocols followed, we were able to both increase iLevel's driving speed to 3.5 mph and have a field update for existing units in under 4 days." Quantum looks forward to using QRRS as an industry-leading tool toward further refining its consumer-inspired complex rehab products, reducing time-sensitive gaps between field feedback and real-time solutions. Quantum Rehab® is a global innovator of complex rehab products, including the Q6 Edge® 2.0 and Quantum Series of power bases, iLevel™ seat elevation technology, TRU-Balance® 3 Power Positioning Systems, Q-Logic 2 Drive Control System, Synergy® Cushions and Backs, and Stealth® Products positioning components. 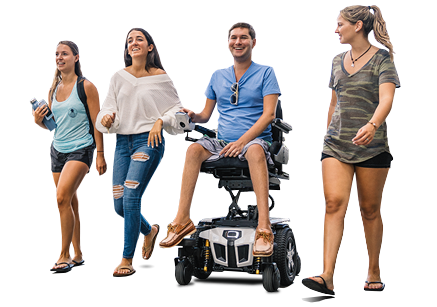 Clinically-focused and consumer-inspired, Quantum Rehab products are engineered and manufactured to meet the widest range of needs with functional, durable, stylized, high-performance designs to increase quality of life. For more information on Quantum Rehab's premier complex rehab products, please visit www.QuantumRehab.com.